University of Illinois Beckman Institute postdoctoral researcher Agnieszka Burzynska and her colleagues analyzed the brain and cognition of Olga Kotelko, a 93-year-old track-and-field athlete. Burzynska is now a professor at Colorado State University. CHAMPAIGN, Ill. — In the summer of 2012, Olga Kotelko, a 93-year-old Canadian track-and-field athlete with more than 30 world records in her age group, visited the Beckman Institute for Advanced Science and Technology at the University of Illinois and submitted to an in-depth analysis of her brain. Lacking a peer group of reasonably healthy nonagenarians for comparison, the researchers decided to compare Kotelko with a group of 58 healthy, low-active women who were 60 to 78 years old. “In our studies, we often collect data from adults who are between 60 and 80 years old, and we have trouble finding participants who are 75 to 80 and relatively healthy,” said U. of I. postdoctoral researcher Agnieszka Burzynska, who led the new analysis. As a result, very few studies have focused on the “oldest old,” she said. “Although it is tough to generalize from a single study participant to other individuals, we felt very fortunate to have an opportunity to study the brain and cognition of such an exceptional individual,” said Beckman Institute director Art Kramer, an author of the new study. The women in the comparison group underwent the same tests and scans. The researchers wanted to determine whether Kotelko’s late-life athleticism had slowed – or perhaps even reversed – some of the processes of aging in her brain. “In general, the brain shrinks with age,” Burzynska said. Fluid-filled spaces appear between the brain and the skull, and the ventricles enlarge, she said. “Her brain did not seem to be, in general, very shrunken, and her ventricles did not seem to be enlarged,” Burzynska said. On the other hand, she had obvious signs of advanced aging in the white-matter tracts of some brain regions, Burzynska said. “Olga had quite a lot white-matter hyperintensities, which are markers of unspecific white-matter damage,” she said. These are common in people over age 65, and tend to increase with age, she said. As a whole, however, Kotelko’s white-matter tracts were remarkably intact – comparable to those of women decades younger, the researchers found. And the white-matter tracts in one region of her brain -- the genu of the corpus callosum, which connects the right and left hemispheres at the very front of the brain -- were in great shape, Burzynska said. 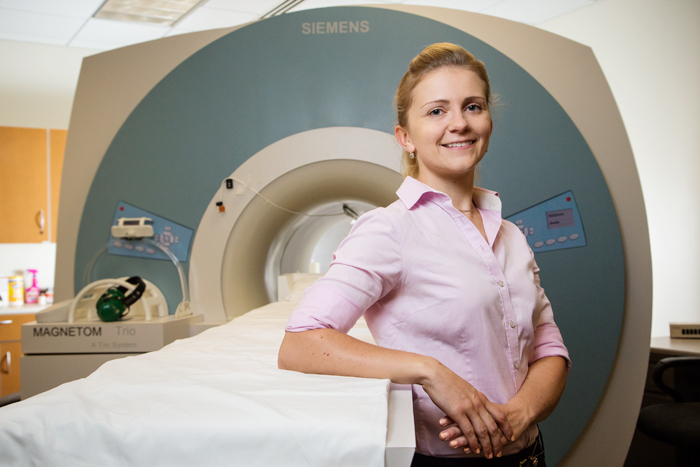 “Olga had the highest measure of white-matter integrity in that part of the brain, even higher than those younger females, which was very surprising,” she said. These white-matter tracts serve a region of the brain that is engaged in tasks – such as reasoning, planning and self-control – that are known to decline fastest in aging, Burzynska said. Kotelko performed worse on cognitive tests than the younger women, but better than other adults her own age who had been tested in an independent study. Her hippocampus was smaller than the younger participants, but larger than expected given her age, Burzynska said. The new findings are only a very limited, first step toward calculating the effects of exercise on cognition in the oldest old, she said. The Robert Bosch Foundation and the National Institute on Aging at the National Institutes of Health supported this research, as did Abbott Nutrition, through the Center for Nutrition, Learning and Memory at the U. of I.
Kotelko biographer Bruce Grierson prompted researchers at the Beckman Institute to study Kotelko’s brain. Editor's note: To reach Agnieszka Burzynska, email agaburza@illinois.edu. To reach Art Kramer, call 217-244-1933; email a-kramer@illinois.edu. The paper “White-matter integrity, hippocampal volume and cognitive performance of a world-famous nonagenarian track and field athlete” is available from the U. of I. News Bureau.